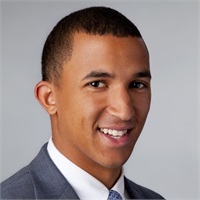 Aaron McFadden joined Commonwealth Financial Group in May of 2014. Prior to joining us, Aaron spent almost 3 years as a financial advisor at Northwestern Mutual. Aaron’s work at CFG is centered on families with children. His practice is primarily focused on the building blocks of financial and estate planning with a particular expertise in planning for families of children with special needs. He currently holds designations as a Chartered Life Underwriter (CLU®) and a Chartered Special Needs Consultant (ChSNC). Aaron graduated from Bentley College with a degree in corporate finance and accounting, while a member of the Falcons’ football team, the university’s investment group, and the Student Athlete Advisory Committee. Aaron currently resides in Boston with his wife Samantha and their three children, Quinton, Camryn, and Beau. He is a die-hard Patriots fan and enjoys the occasional round of golf (though he’s admittedly a better bowler).